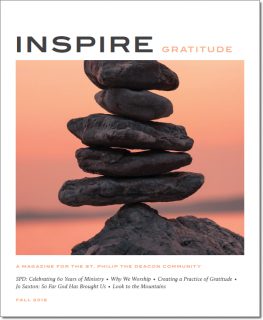 This week we have launched Inspire, a new quarterly magazine for the people of St. Philip the Deacon. This magazine has been in the works for the past year as we have thought about new ways to celebrate the ministries of St. Philip the Deacon, reinforce the beautiful community we share, and invite others to join us in our mission. Inspire will feature stories about members, interviews with thoughtful Christians like our Faith & Life speakers, meditations, book suggestions and reflections on how we live out our faith in daily life. Each issue will be based on a theme, and the first issue will focus on Gratitude. Look for it in your mailbox, and—once you’ve read it—please feel free to pass it on to a friend. You can also read Inspire magazine online.